(2011) MARVEL COMICS X-MEN LEGACY #249 252 AND 253 FIRST ENDGAME! 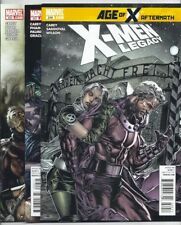 X-Men Legacy 253 (2011) 1ST APPEARANCE ENDGAME!! X-Men Legacy 252 + 253 (2011) 1ST CAMEO APPEARANCE ENDGAME!! X Men Legacy 253 1st Appearance Endgame Cates See Description CGC CBCS It!